It may all change when Louis Van Gaal finally unleashes his new-look starting XI against QPR at Old Trafford on Sunday but his starting XIs so far in this nascent Premier League season have been among the youngest in the division and among those with the most English players on average. 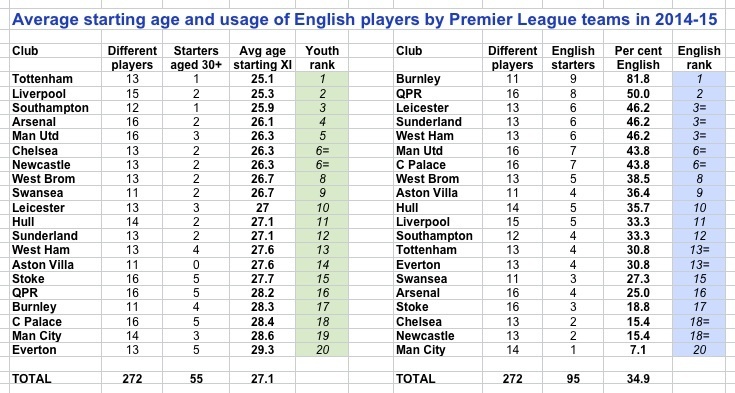 Their 16 different starters in the league have had an average age of 26.3 years and they have used seven different English starters – bettered only by Burnley’s nine and QPR’s eight. Across Manchester, United’s rivals City have fielded the team with the fewest English starters: just one, Joe Hart, so far. And the average age of their players so far has been 28.6 years. Only Everton have had an older average. It’s early, of course. Things will change. Van Gaal will almost certainly opt to use the foreign riches he purchased in the summer. But United’s young and English teams so far have contrasted with City’s more mature and imported XIs. As the first graphic shows, Tottenham have had the youngest starting XIs on average so far (25.1 years) and Everton the oldest (29.3 years). The average age of the 272 different starters in the League has been 27.1 years. Liverpool, Southampton and Arsenal are among the others giving youth their head. QPR, Burnley and Crystal Palace join City and Everton with faith in the senior citizens of the game. Liverpool’s starting XI that went on to beat Spurs 3-0 in the most recent round of games was the youngest starting XI in the division this season so far at just under 24.5 years old on average. Steven Gerrard at 34 was counter-balanced by 10 others who averaged 23 and a half. Of the 272 players who have started a Premier League match this season, 94 have been English, or 34.6 per cent. Three clubs – Aston Villa, Burnley and Swansea – have started all their three games with the same 11 players. Nine of Burnley’s 11 players are English, the exceptions being Michael Duff, from Northern Ireland and Scott Arfield from Scotland. Our table above indicates that five clubs have already used as many as 16 different players to start games. Manchester City have used only one English starter: Joe Hart. 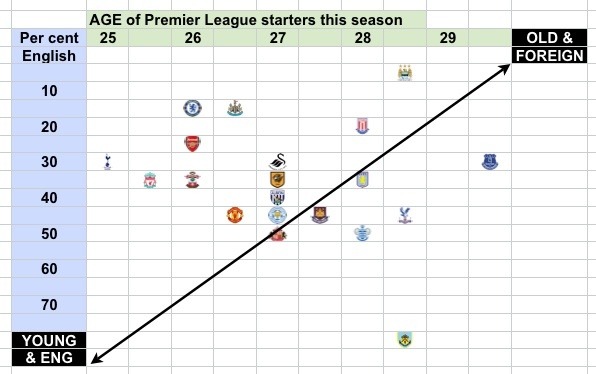 Newcastle and Chelsea and then Stoke have used the next fewest English starters. Julian Speroni 18 May 1979, C Palace; Tim Howard 6 Mar 1979, Everton; Rio Ferdinand 7 Nov 1978, QPR; Clint Hill 19 Oct 1978, QPR; Michael Duff 11 Jan 1978, Burnley; Sylvain Distin 16 Dec 1977. Everton. Newcastle visit Southampton on Saturday with historical odds stacked against them. It will be the Saints 293rd home game in the Premier League and of the 43 clubs they have faced (Burnley will provide fresh Premier League opposition for them this season, Saints absent last time they were in the PL) they have gained most points from Newcastle, and among the most points per game. The one Newcastle Premier League win in Southampton happened almost exactly 10 years ago on 19 September 2004 when a goal from Anders Svensson for Southampton was not enough to overturn a David Prutton own goal and Stephen Carr’s winner. It was the season that the Saints were to experience their only Premier League relegation from which, incidentally, three points would have saved them. These historical stats often throw up fascinating by-products. 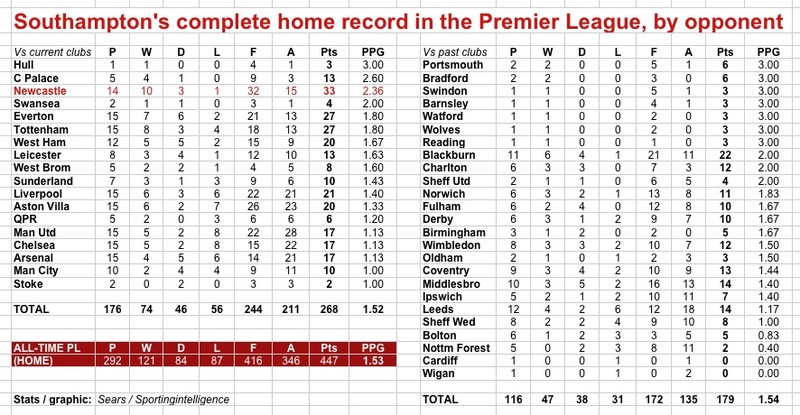 Are there any Saints fans that still recall how difficult it was for their team to register a Premier League victory at home to Nottingham Forest … no win in five attempts.